Bedroom on the top floor of the Derry, New Hampshire farmhouse. A storm rages outside; icy flakes beat against the windows. In the snow-light, the dull light of an obscure moon and the pale yellow light of an outside lamppost: two figures huddle under an old quilt. The hair on the pillows is short and white, and shoulder-length dark gray. The white head bobs on a sea of self-afflictions. (In sleep; excited–) No…. Don’t do it! (Asleep–) Damn boy! Don’t! Don’t! A dream…. Are you… all right? (Turning on night lamp, sitting up in bed; looking around–) Where are my glasses? In the drawer…. Are you all right…? Go back to bed! (Mimicking her–) “Go back to bed…. Go back to bed!” (As he fumbles in the drawer–) Which drawer? (Irritably–) The nightstand drawer! Where they always are…. Behind your papers…. (Finding them–) Why didn’t you say so? Why do you always hide them? (Wearily–) They’re always there! Sleep, Robert…. Sleep…. (Gentler now–) Go back to bed…. (Likewise–) Are you all right? Yes…. (To himself–) A half-lost dream that took a half-familiar form…. Sitting up, he puts on his fur-lined slippers, shakes his head, rises…. (Mimicking–) “Wear your robe!” (Softer–) Go to sleep. I’m a big boy…. (Half asleep–) You always forget…. FROST touches her shoulder gently, rises, puts on the heavy flannel robe, slips his glasses into the breast pocket, and walks with the careful gait of an old, but vigorous, man to the next room. (To himself–) Now, what in blazes! Where did she hide my glasses? Let’s see… let’s see…. (Erupting–) Damnation! He checks his pockets again, stands up; searches his desk until he finds the pencil he wants, sits at his writing-chair again. He checks the point of the pencil, licks it, and writes quickly, as though from memory or from dictation. He mumbles to himself as he writes…. But for itself it came, from beyond the night. (To himself, critic now–) Hmmm…. (Emphatically–) Garbage! He crumples the paper, brushes it onto the floor. The wind rises; a draft stirs the remaining blank pages on the improvised desk; FROST covers them with his hands, weighs them down with his pencil and glasses. He looks around the room, feeling a presence. He picks up the crumpled paper, smooths it out on his desk, turns the collar of his robe up, crosses out some lines, then continues writing. (Looking up nervously now–) Who’s there? (He doubles his editing efforts; reads–) “while the voice up-roared….” (He scratches out the word.) “…while the ghost up-roared… ghostly uproar….” (Looking around–) That you, Carol? Show yourself! I’m not afraid…. FROST puts a paperweight on his notes, walks to the window; stands with his back to audience, hands clasped behind, watching the eddying snow. His shoulders hunch as he realizes the impossibility of discerning the form he seeks. He looks around the room, looks up and down…. And something broke your mind in two? Around the circle of that witness moon. The white, blind eye of that tell-tale moon…. Wasn’t it something that I failed to do? Not bury his son because he couldn’t hear! Lights off as the wind howls and shutters flap against the wooden frame of the house. Spotlight FROST standing stock-still, staring. Another spotlight falls upon a corner of the room: smoke rises in this light. As the smoke clears, we see the spectral form of CAROL, standing behind the light. 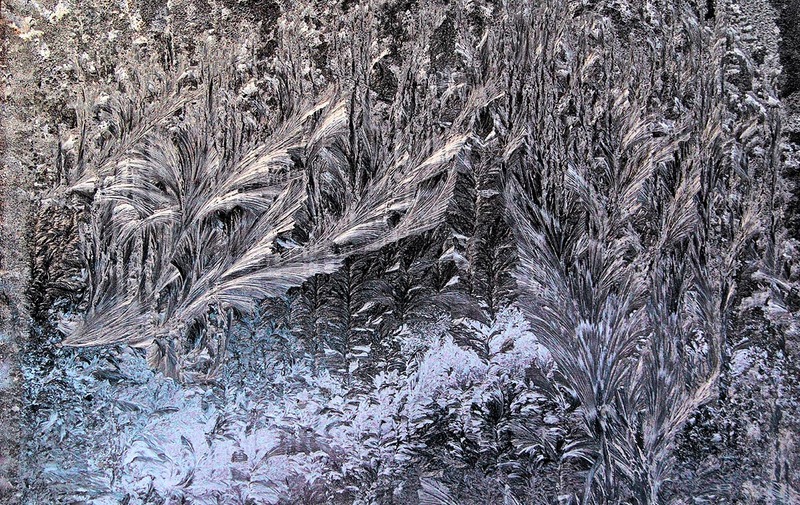 Throughout the following exchanges, FROST relates to the light as much as to the form obscured within it. (With a wan, thin voice–) I came because you said so. You summoned, and I came. Ahhh! (Quickly withdrawing, cradling his hand–) Cold! Cold as the eyes of one we loved… and wronged…. Maybe not… that cold! Why did you call me? The spotlight begins to dim. Why should I wager you’re the thing you seem? And failed the test of water! How can I trust my senses when my senses reel? I am old…. I am afraid…. Give me a sign! I know that voice—even from Hell’s gates! Carol… my son… my son! Is this what’s become of your fine head? Could I pass so little on? Why do you haunt your father’s dreams? I came because you called…. Who’s to squeeze a meaning out of that? I called because you haunt me! (Mimicking–) I called… because you haunt me! He should have been a stronger man! His soul cut down his soul! Why trouble me for absolution? That is not given; that is seized! The light flickers as a draft comes from the window. Not yet! Not yet! (He reaches for the circle of light–) A word…. The light grows strong again. Might have made a world of difference. How much could one small word have cost? That’s the thing you want to throw at me! And you hurl it at my head! But couldn’t spare a penny of a word for you. A single syllable… to change the world! And what’s the cost? A penny? Words were always burrs between our saddles! But there was no heart in your writing…. And, saying it, said too much. I never could say anything that wasn’t there…. I could fantasize on paper… but…. And make it seem like it was there in you. Words were kindling for what was there in you! To turn the darkness inside out. What made you think I could? I wanted you to go beyond… what I could do…. In spitting distance—and spit it out! That’s just a trick of Nature! I wrote out of that fact! You never learned the trick! I never learned to show you! Not knowing how to show it! Happy families can take the hints. And everything I ever wrote about! Teaching facts to fetch for you. You took everything so serious! Life is a deadly serious game–but still a game! I played it–and I lost…. You should have played it better! That’s all I ever tried to teach! Was it pride you wanted, pride instilled by me? “Is that the worst that you can give? To help us penetrate the kernels of our truths! They help us mask a multitude of sins. You saw my best…. It wasn’t good enough for you! Why didn’t you call me? Why didn’t you write? I would have come to you! “Happy families can take a hint. The light flickers, FROST reaches to hold it back. Get back the thing we lost! (To the faded vision–) Wait! … Carol! (To himself–) He should have made some accusation! I’m no good doing it myself! (Coming around to her; excited–) Did you see… did you hear…nothing? Just you, talking to yourself again. You know what day this is, how many years? The day we practice all year to forget. The day you never mention…. (Touching his arm; gently–) Robert…. (Inspecting the room; insistently–) He was here! She puts her hand tenderly on his shoulder. You couldn’t have stopped him…. He should have been stronger! Why didn’t he tell me what he had in mind? I could have helped him—if I knew. Leave him in his world! The scaffolding… what holds it all together! He wanted me to say that they were good. But the thing around them was no good. He was trying to escape into his poems! But they had no center! Everything he tried was like that. And what I never gave him. Like Theseus and the Minotaur. He got lost in all the winding. The wild beast ate him up! To carry on the speech. He’s gone now…. Let him go! You’ve carped that tune before! (Wearily; and warily–) This isn’t about us! Don’t make it so…. The way you do when something’s brewing in you. You said that I was selfish! And owned by something greater than himself…. (Not placated–) You said it! Don’t deny it! (Looking around–) Other ears than mine can hear you! This is no night for idle talk. I never quarreled with the life we lived. You did the thing you had to do. I know. Did you ever hear me murmur, “More…”? We took the worst of it. We made our bed. It was I who wanted more—to give you more! I wanted him to say–I did my best…. I thought he had…said that to you? To understand him… to understand my son…. We never could say that to one another. You couldn’t say it, so you wrote. Now write finale … Let him go! And throw it in the wind? I could have forgiven anything but that! God would have forgiven anything but that! Had I some hand in it? I curse these old man’s hands! Robert, Robert, this will not do…. These hands are life-preservers, not life-takers. It’s over, Robert…. Let him go…. (Wearily–) What could I have done? There are things I can’t let go. There are people…. (Warily–) They come and stalk me…. I made things happen on the page…. (Wryly–) Man writes, God publishes…. Don’t you remember what the Good Book says? (With a heaving sigh–) He never could find his…. I couldn’t help him…. Absalom, Absalom…. The dark film will be lifted from your eyes. (Rubbing his eyes–) As long as you are with me…. So much trouble just to write a line! I’m always with you, Robert. So you promised long ago—even unto death. It’s just you, talking to yourself. It’s what you go through time-to-time. When you feel the weight of years…. “Cleaning the gears,” you used to call it. I’m 70! I’ve forgotten more than I recall…. You lived your three-score years and ten. (Shrugging–) It’s just what is. I’ve learned to live with it! Or not to live with it! For a thousand and one nights! I can wrestle with some angels…, not with you…. (Musing–) My heart was never very strong…. Enough gobbledygook for one eternal night! You’ll go to sleep now… and I will sleep beside you. I will wrestle with the syllables that woke me. You are here! I feel you in my arms! You! My Elinor! My Ellie! I was never very strong…. I gave you what I could. So you could give—the gift outright. You gave more than you could…. I never said it. I couldn’t say it to you. How long has it been now, since—? You shouldn’t have left me when you did! Dreams within dreams… and yet, we dream…. With warnings. And yet, we do not want to hear…. The nether world, and this and that! I am weary of this dream! (Raising her collar against a sudden draft) It’s cold! (Almost as an afterthought–) You’ll be coming along soon, Robert? (To herself–) You’ll be coming along soon…. I have missed you… more than I can say…. (Absently) Yes…. Yes…. I’ll be all right now…. Soon…. Soon…. Like a necromancer of old! Faust in all his power! To call my heart’s blood from the dead! The fools flourished, and I put on pride! Into the night laboring, clothing myself with pride! And I established my house in pride! What Artist worth his salt does not? Pride took me to Shakespeare’s realm! Pride took me home and crowned my head with laurels! Hard-won–but I could turn my back on it! To love it–but not need it! I could not tell him so! I could not make him understand! We need it to begin anything worth beginning. And to end what’s worth ending! As we walk out on overbearing love…. To tell ghosts what we could not utter then…. To grasp the raw essentials. And blew cold breath in the wizened ear. Over the roof of the world lay fear. And the words, at last, would make them wise. FROST puts the paper down and smooths the page. He stretches his large frame, extending his arms above his head in a “V”—a slow victory sign. He turns the light off and exits. As he shuts the door, the spectral light appears over his desk. The wind howls, the shutters beat against the house. A gust of wind comes from nowhere and scatters the papers…. Gary Corseri has published articles, poetry, fiction and dramas in The Seattle Star, The New York Times, CounterPunch.org, Redbook Magazine, The Village Voice and hundreds of periodicals and websites worldwide. His plays have been produced on Atlanta-PBS and at public schools and universities. He has performed his poetry at the Carter Presidential Library and Museum. He has published novels and collections of poems, edited a literary anthology, and has taught in universities in the US and Japan, and in public schools and prisons in the US.